Fort Leonard Wood, Mo. 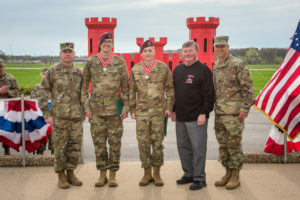 (April 11, 2019) – The 13th annual Lt. Gen. Robert B. Flowers Best Sapper Competition concluded with an awards ceremony Thursday on Gammon Field. In a heavily-contested race to earn the title as the next Best Sapper, Capt. 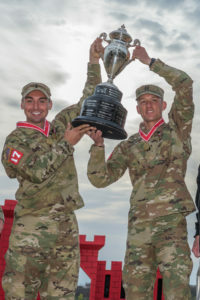 John Baer and 1st Lt. Terence Hughes representing Team 17 with the 39th Brigade Engineer Battalion, Fort Campbell, Kentucky, emerged as this year’s top-placing team. 1st Lt. Terence Hughes and Capt. John Baer, 39th Brigade Engineer Battalion, Fort Campbell, Kentucky, hold up the winning trophy after taking first place in the 13th annual Lt. Gen. Robert B. Flowers Best Sapper Competition April 11 on Gammon Field. U.S. Army photo by Michael Curtis/Released. Command Sgt. Maj. Douglas Galick, U.S. Army Engineer School, 1st Lt. Terence Hughes and Capt. John Baer, 39th Brigade Engineer Battalion, Fort Campbell, Kentucky; Lt. Gen. Robert Flowers, U.S. Army retired, and Brig. Gen. Robert Whittle, USAES commandant, pose for a photo April 11 on Gammon Field. Hughes and Baer took 1st place in the 2019 Best Sapper Competition. U.S. Army photo by Michael Curtis/Released. Command Sgt. Maj. Douglas Galick, U.S. Army Engineer School; Staff Sgt. Lucas Tucker and 1st Lt. Sabin Vaira, 27th Engineer Battalion, Fort Bragg, North Carolina, representing Team 16; Lt. Gen. Robert Flowers, U.S. Army retired; and Brig. Gen. Robert Whittle, USAES commandant, pose for a photo April 11 on Gammon Field. Tucker and Vaira took 2nd place in the 2019 Best Sapper Competition. U.S. Army photo by Michael Curtis/Released. Command Sgt. Maj. Douglas Galick, U.S. Army Engineer School; Capt. Erwin Marciniak and 1st Lt. Jeremy Matsumoto, 299th Brigade Engineer Battalion, Fort Carson, Colorado, representing Team 6; Lt. Gen. Robert Flowers, U.S. Army retired; and Brig. Gen. Robert Whittle, USAES commandant, pose for a photo April 11 on Gammon Field. 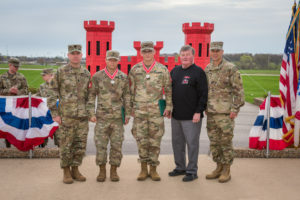 Marciniak and Matsumoto took 3rd place in the 2019 Best Sapper Competition. U.S. Army photo by Michael Curtis/Released.